This is truly a miniature bank building. 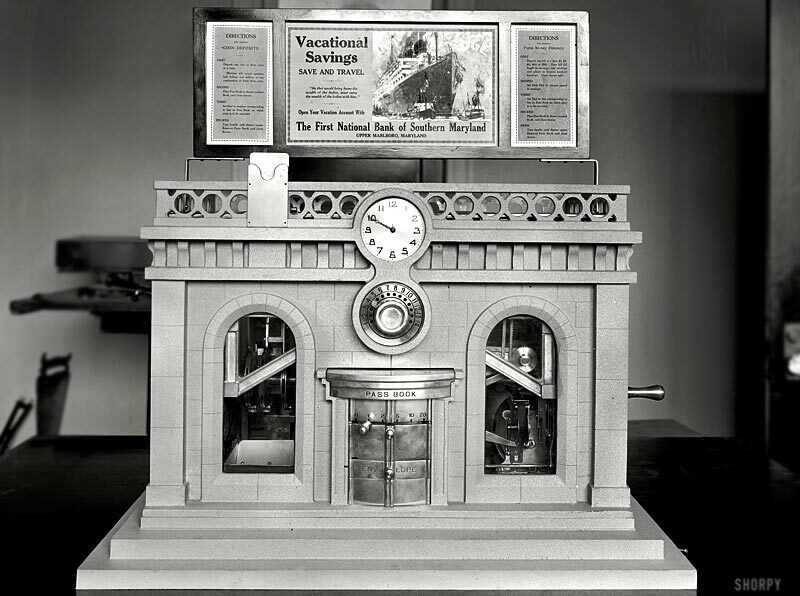 These machines, designed to look like little bank buildings, were used in the D.C. schools into the 1930s to encourage kids to save and develop thrifty habits. I found this image on the historic-photo website, Shorpy. The National Photo Company Collection glass negative was captioned, Washington, D.C., circa 1918. "Bankers Automatic Receiving Teller Co." Directions posted in the photo describe steps to make both coin and bill deposits and will record the amount in a Pass Book. No description of the size of the machine, but it looks like it sits on top of a table and is a few feet tall. 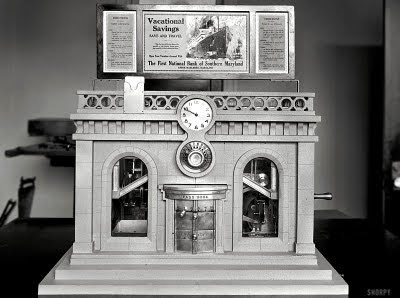 Looks like the machine might have been modeled after an actual building - the First National Bank of Southern Maryland, which is now and M&T Bank in 4000 main street upper Marlboro, Maryland. Could this machine be an early form of ATM? Perhaps, but seems it only took money and didn’t let you withdraw.